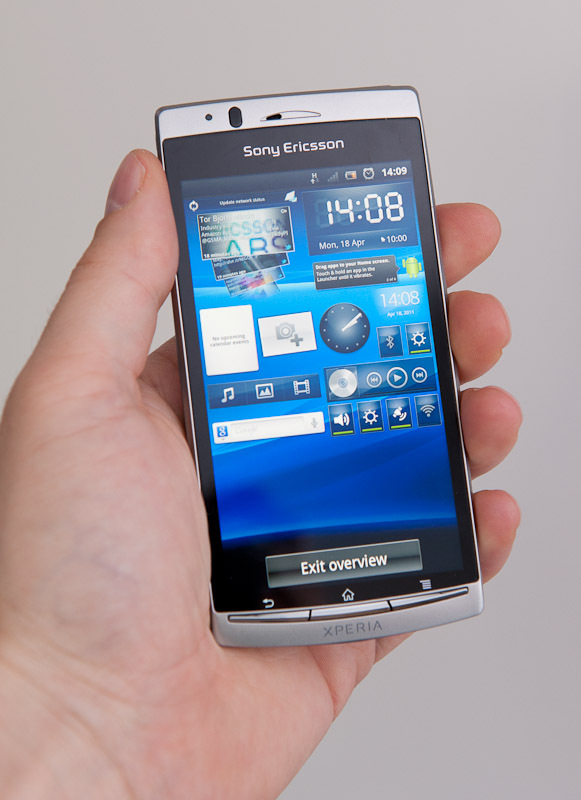 The Sony Ericsson Xperia Arc is one of four new mobile phones announced by Sony Ericsson so far this year. The other three are Xperia Play for gamers, Xperia Pro with a full QWERTY keyboard and the Xperia Neo which is the little brother of Xperia Arc. They are all running on Android 2.3 Gingerbread. The Arc and Xperia Neo share almost all the nice features mentioned in this review but the Arc has a better and larger display but are missing a front facing camera. 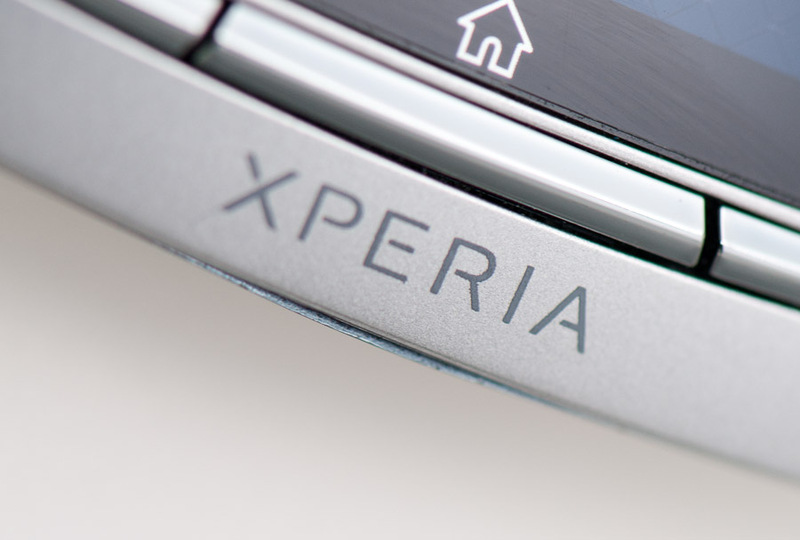 Two new features are introduced with the Xperia Arc. Mobile BRAVIA Engine on a Reality touch display and Mobile Exmor R CMOS camera sensor. Both technologies are originally coming from the mother company Sony but Mobile BRAVIA Engine are developed jointly by Sony and Sony Ericsson. 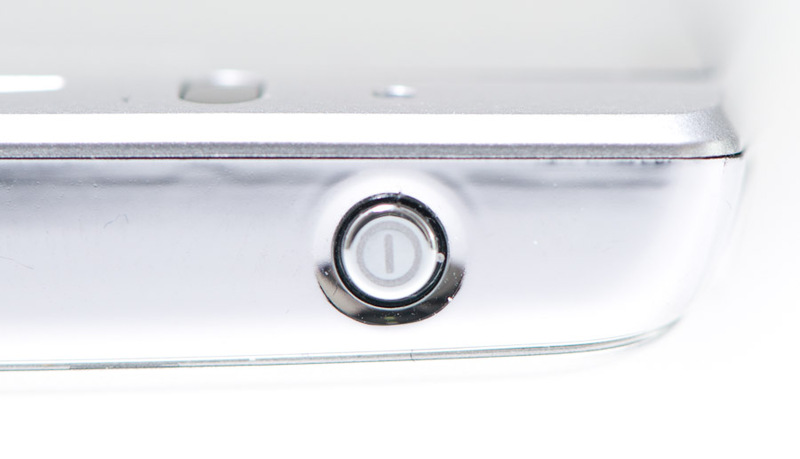 Rumors are saying that Apple will have the Exmor R sensor in the upcoming iPhone 5. 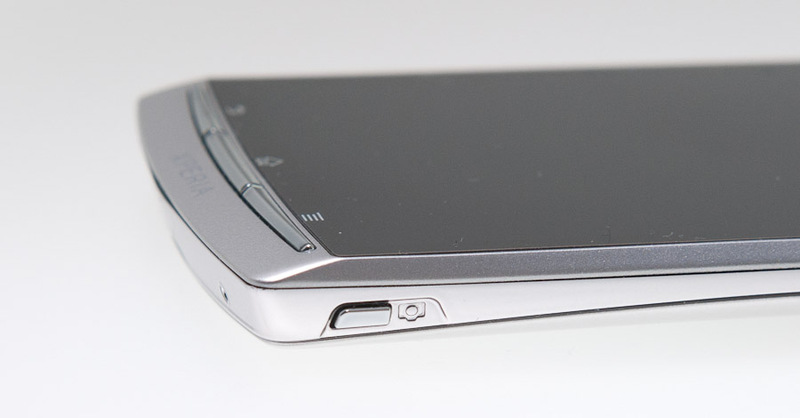 Even if it is thin, the Sony Ericsson Xperia Arc is a relatively large smartphone with a large display. It ships in two colours and the exterior are made of hard plastic. Some users do not like plastic, but the weight are kept down and the durability is nothing to complain about. Too bad we got hold of a preview sample which a small production fault. The glossy frame going all around the phone is glossy and nice. But on our test unit the bottom of the frame seems be out of position. Take a look at the photo where the frame are out of line with the silver front frame. 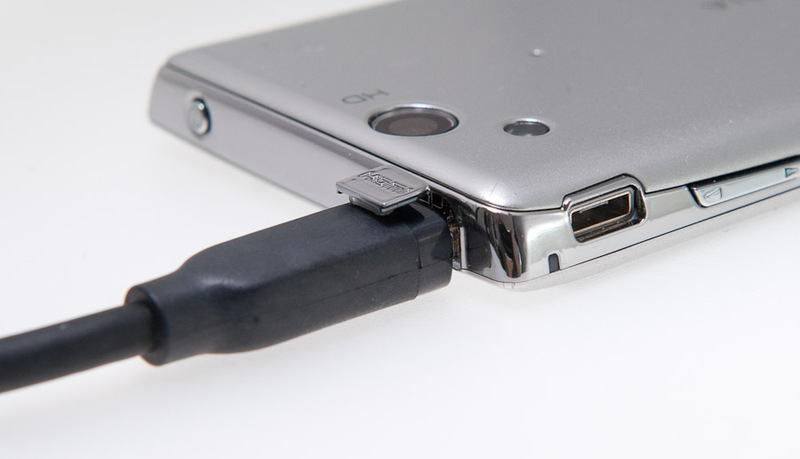 Two of the three main mandatory Android keys has switched places compared to all older Android Xperia models. The Back key are located to the left and the Menu key to the right. 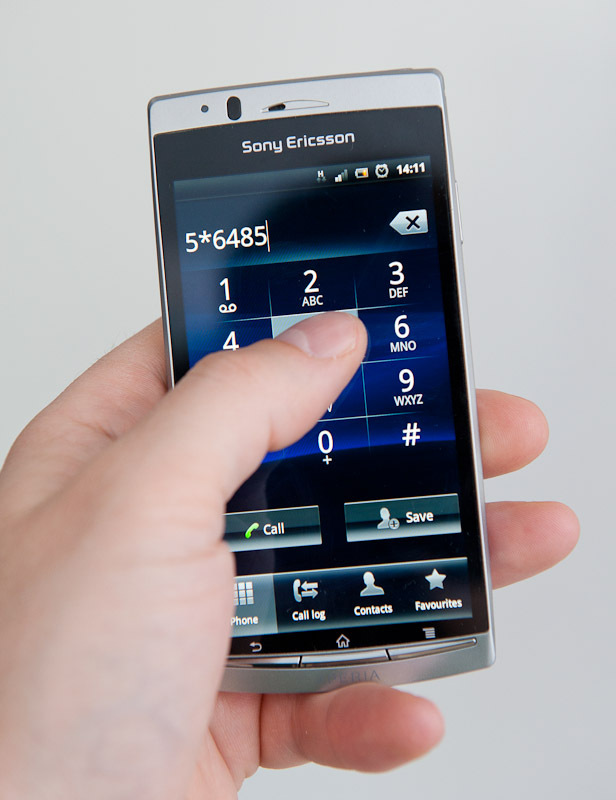 Sony Ericsson has performed user test cases and most users wanted the back key on the left side of the Home key. 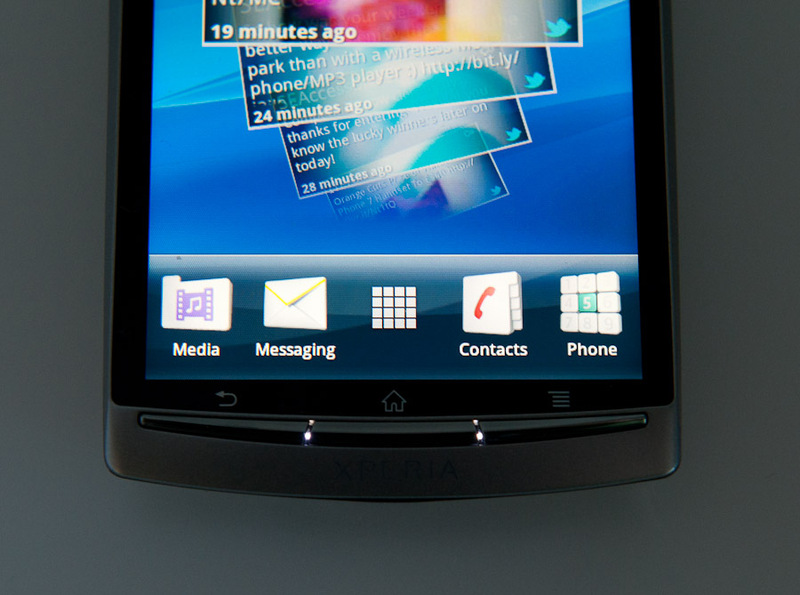 Xperia Arc has a 4.2 inch Reality touch display with a 480 x 854 pixel resolution. 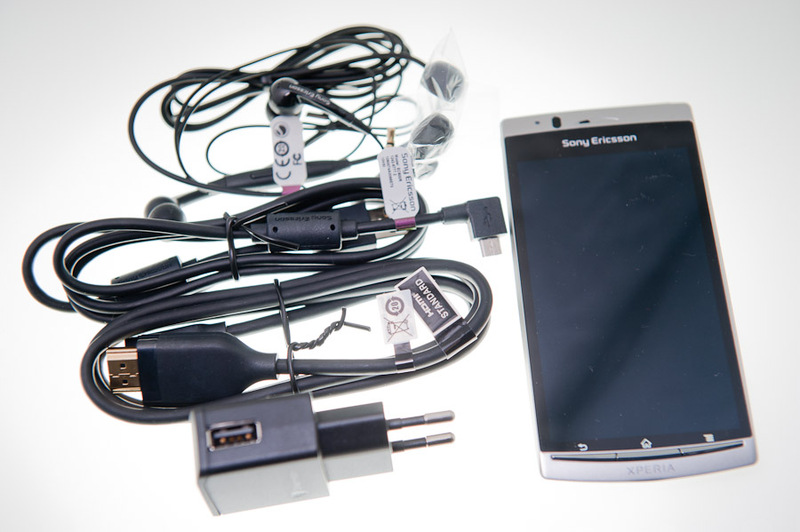 It is the Sony Ericsson model with the largest display to this date. 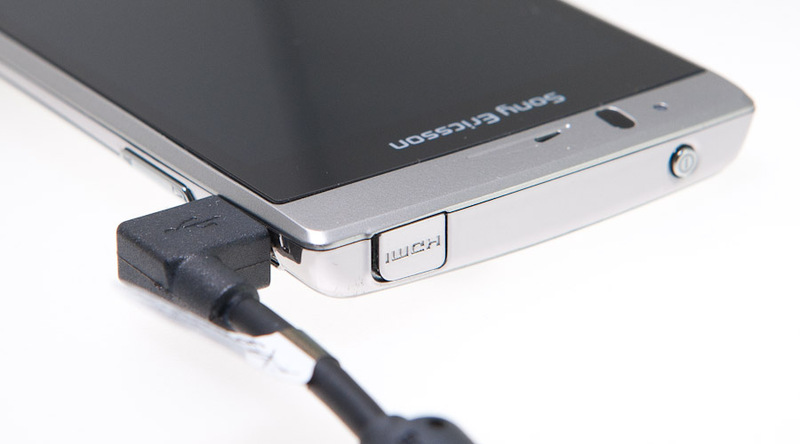 We spoke to Yamada Hiroshi, the Xperia Arc product manager at the Mobile World Congress in February. And according to him, the glass in front of the LCD display is fastened directly on the LCD which is one of the things that improves the viewing impression. By fastening the protective glass closer to the LCD pixels, it is possible to make a thinner display. 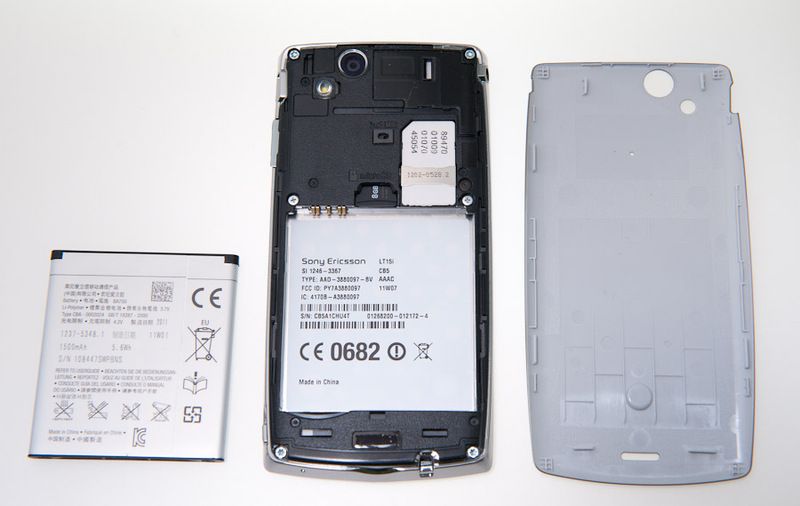 The display size and the way the protective glass is fastened on the LCD is also the main difference between the little brother Xperia Neo and the Xperia Arc. The display is scratch-resistant with shatter proof sheet on mineral glass. After using the Arc for over a month, we have managed to get some scratches on the screen. All but one of them are hard to see without looking through a magnifying glass. Luckily, none of the scratches are visible when the screen is lit. 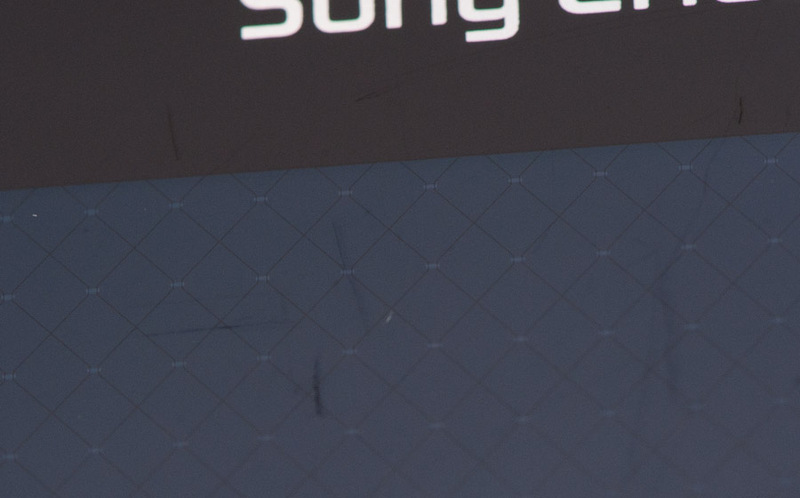 You might have heard about the Sony BRAVIA technology used by Sony on their TV-screens. 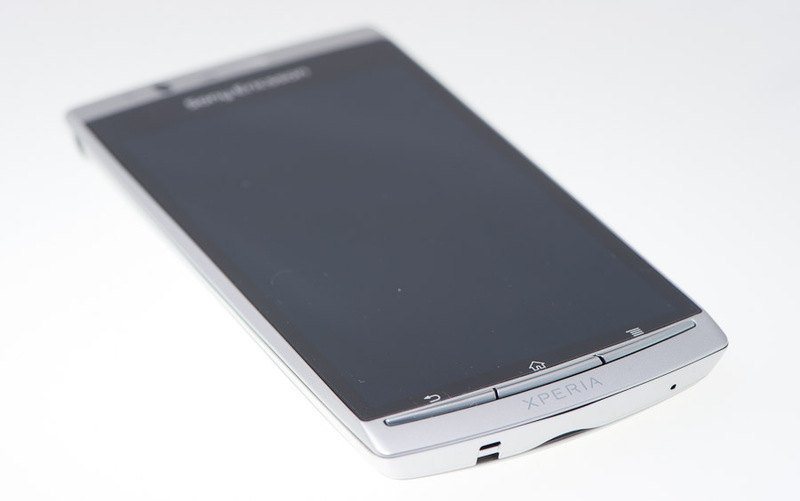 The Xperia Arc is powered by Mobile BRAVIA Engine which are a feature developed jointly by Sony and Sony Ericsson. 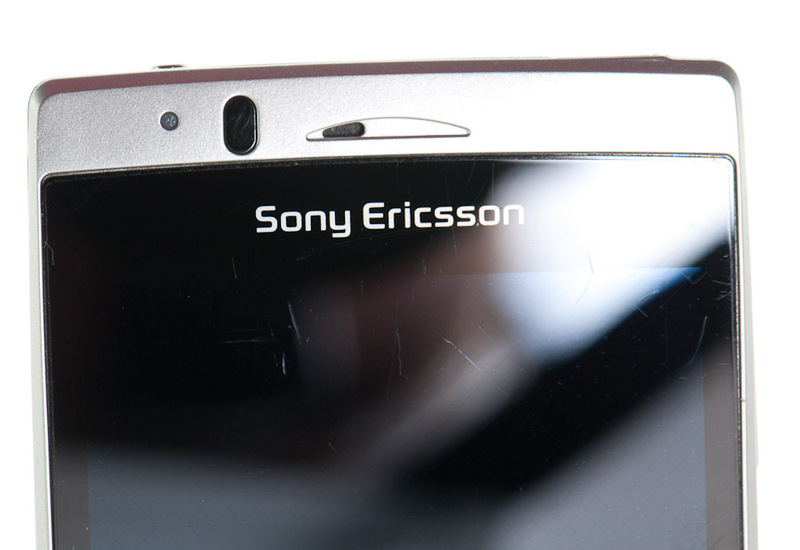 Rikard Skogberg, the official Sony Ericsson product blogger, told us on a direct question that the Mobile BRAVIA was a software only solution. So it seems that no special hardware is required to host the BRAVIA Engine and thus it should be easy to implement the same feature on future Android devices as well. The Mobile BRAVIA Engine enhances photo and video image quality. It does so only in the gallery application. The BRAVIA engine does not affect other parts of the phone such as web browsing, gaming etc. 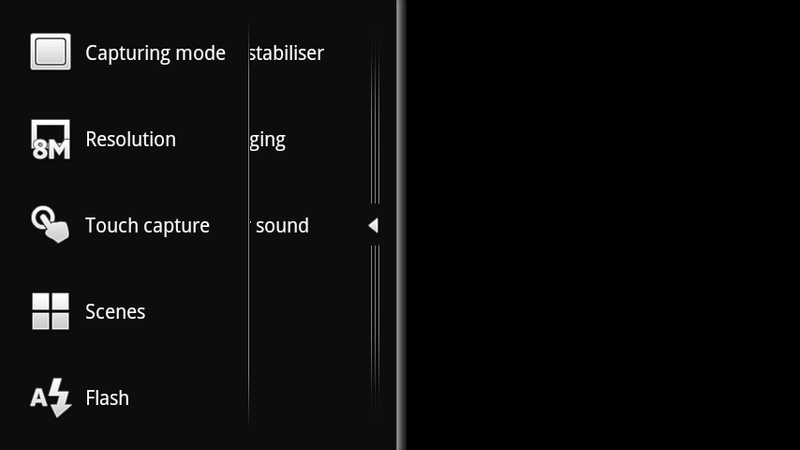 The Mobile BRAVIA Engine can be switches off if you do not like the effects. Having Mobile BRAVIA Engine only available for the Gallery app tell us that this is not a OS feature, but something thats build in into the gallery app. As a result, third party gallery applications will not be able to take advantage of the Mobile BRAVIA enhancements and the 4.2 inch Reality display will be viewed just like any other display. We have compared the effect of the Mobile BRAVIA Engine by viewing images on the display and doing screen captures and believe that Mobile BRAVIA gives the most realistic impression for still images. Enhances the contrast. Deeper blacks and subtle layers of gradation create a crisp picture with a stunning sense of depth. Matches the colours. Exact colour reproduction means what you see is exactly as it was filmed, with incredibly natural colours. 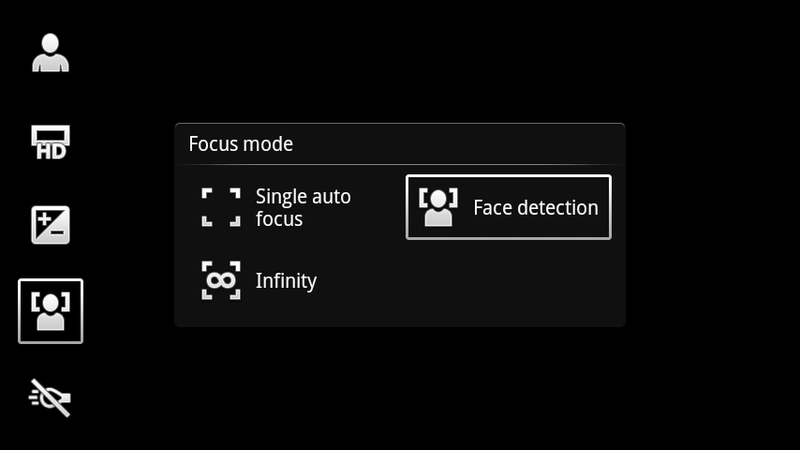 Reduces colour distortion. 3D Comb filtration decreases cross-colour leakage and other distortions so you enjoy a more stable picture. Smoothes the motion. Prevents jagged edges and bleeding colours in fast moving sports and action sequences. Deepens the greens and blues. These traditionally difficult colours receive specific enhancement to brighten and deepen blue and green subjects. Demonstration of the Mobile BRAVIA Engine. Apart from the "smoothes the motion" point, we are not sure which of these steps are applied on still and/or moving pictures, as it is easier for us to do a direct comparison of the still photos. 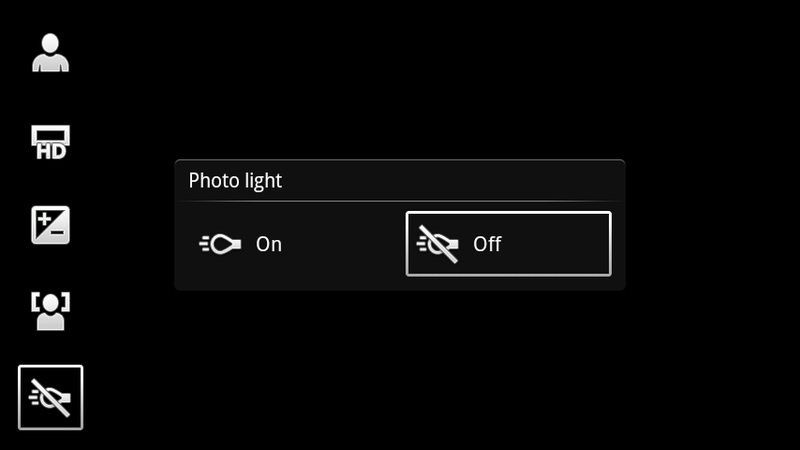 Regardless of which of these steps are applied on media when viewed on the display, it is much better to do the modification in real time without modifying the source images during image capture. Artificial sharpening of photos is something we do not want to happen until we print out the picture. 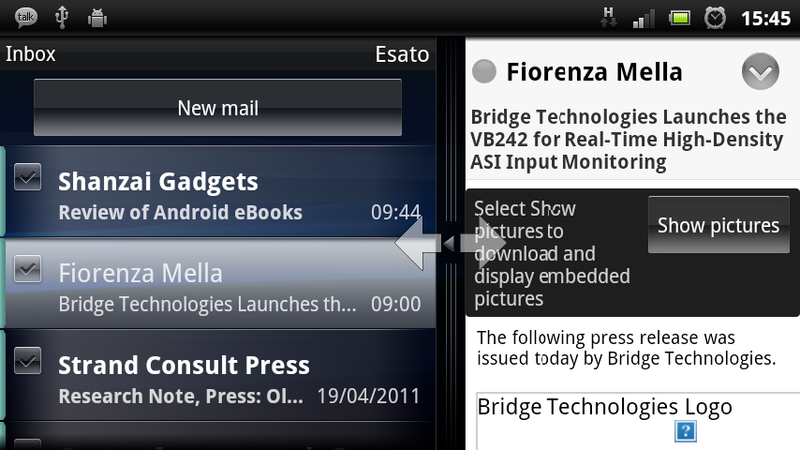 To better understand what the Mobile BRAVIA Engine does to the Xperia Arc display, please take a look at this page where this is demonstrated. We have transferred a handful of photos to the Arc which we have captured with a DSLR earlier. We then made a screen dump with and without the Bravia Engine turned on. 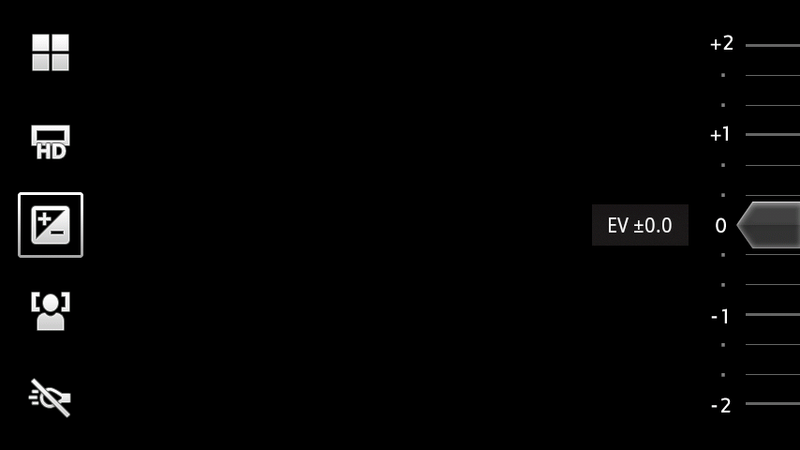 Move the mouse over the images on the example page to see which difference the Bravia Engine does. What the Mobile BRAVIA does to the media shown on the display is usually what the most compact cameras are doing to the image files. 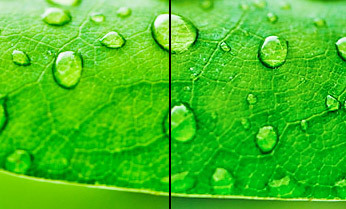 Sharpening and adding extra contrast and saturation will give images that extra pinch. 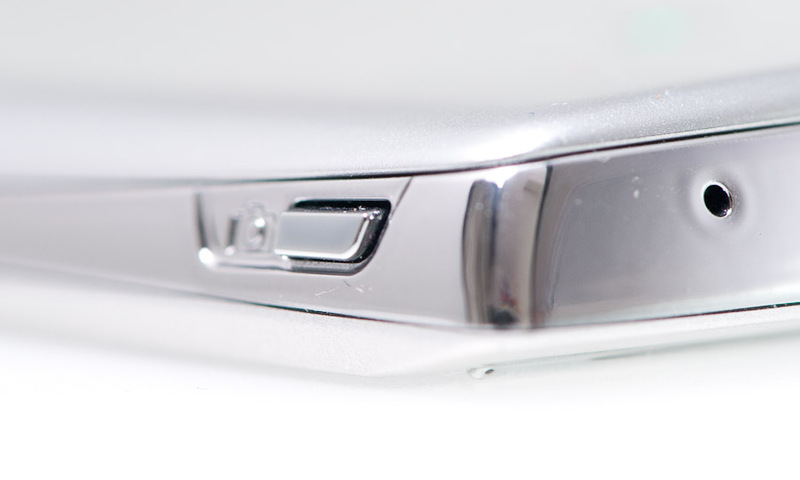 The same trick found in Xperia Arc is also used by television manufactures to showcase TVs in stores. Most modern televisions has a demo / store mode where the above mentioned parameters are increased to the maximum. 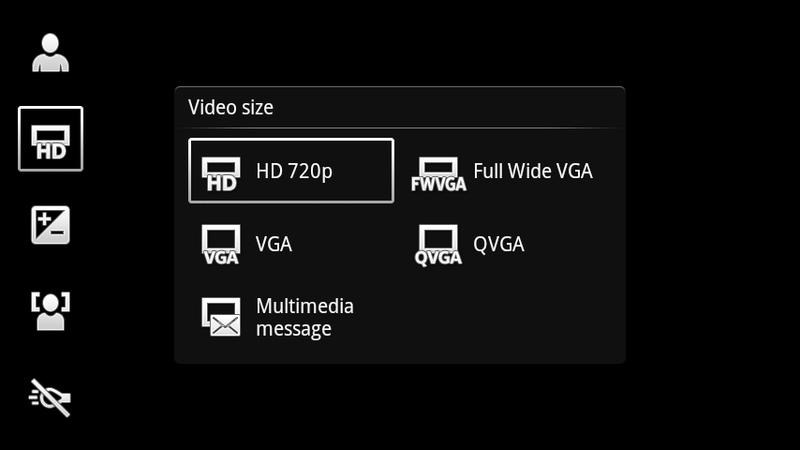 In our opinion, the extra pinch given to video and images by the Mobile BRAVIA Engine are positive. By adding these modifications in real time to the user, the image and video sources are unaffected. The display size and quality is of course just one of Arcs key selling points. The other features being highlighted with this phone is that it is the worlds second phone model running the latest version of Android 2.3 Gingerbread. 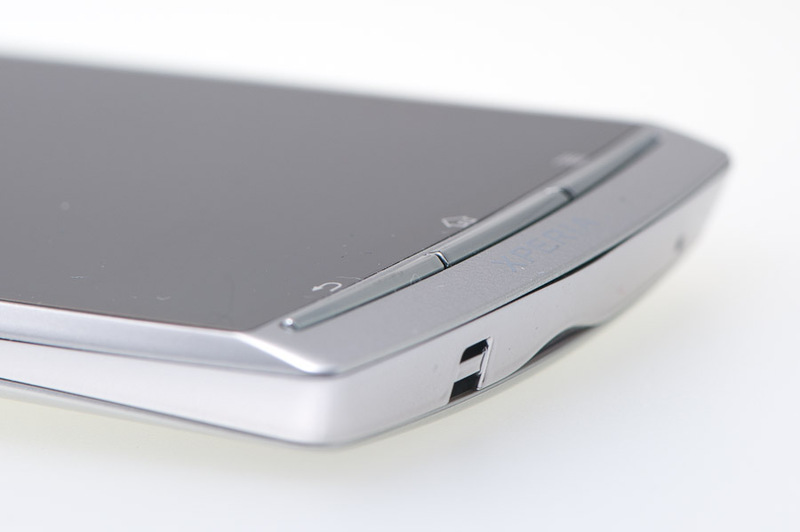 The form factor and thickness is also something that differentiates this Android smartphone from the other models and the Human Curvature design by Sony Ericsson continues with the Xperia Arc. 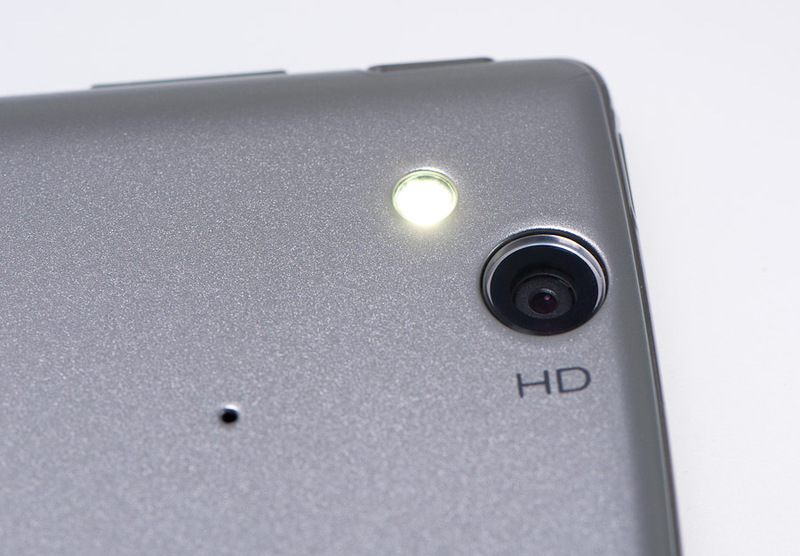 The Xperia Arc is the best mobile phone camera we have tested to this date. In terms of picture sharpness and megapixel, the camera is as we would expect from a 2011 mobile phone. 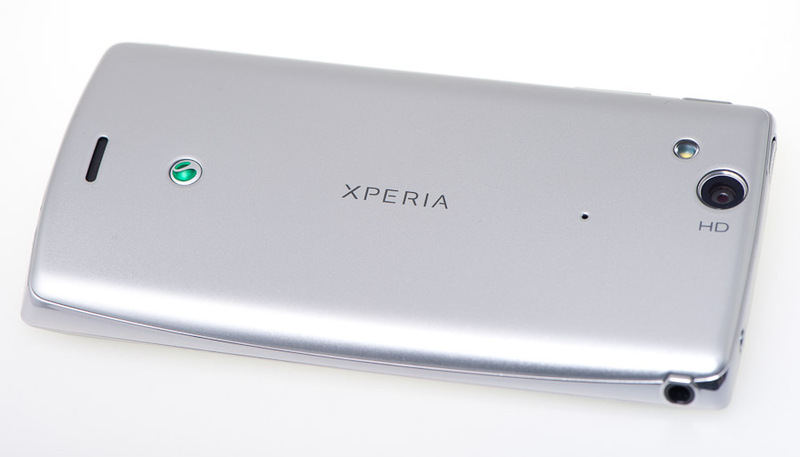 The Xperia Arc has a 8 megapixel (3264 x 2448 pixels) camera with auto focus, face recognition, smile detection and geotagging. Whats particularly impressive with the Xperia Arc is the low light capabilities. The combination of a f/2.4 lens and the Exmor R CMOS sensor will earn you approximately one extra exposure value. The official Sony Ericsson specifications says it has a 8.1 effective camera, but the pixel resolution of 3264 x 2448 sums up to 7.99 megapixel. We believe that the sensor is 8.1 megapixel and that the 0.1 megapixel frame are used when shooting with image stabilizer switched on. 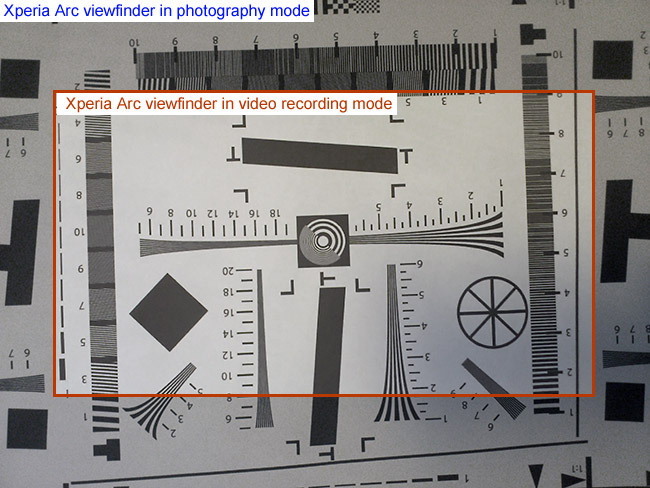 We have reason to believe that the image sensor used in the Xperia Arc is the Sony IMX105PQ with a 3288 x 2472 (8.13 megapixel) sensor. 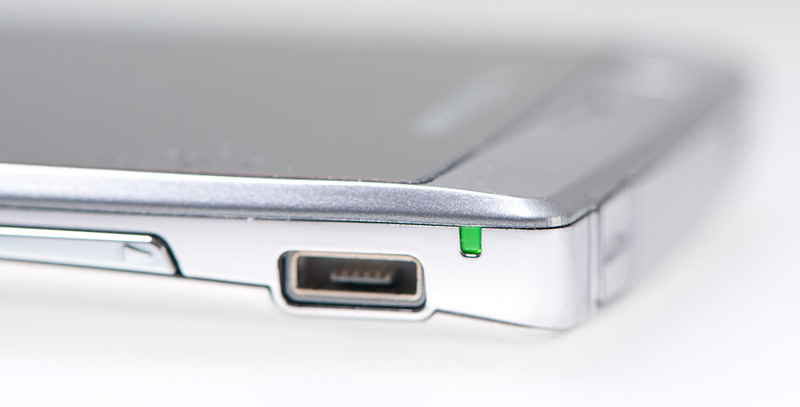 It is not the first time we have seen wrong official specifications from mobile phone manufactures. 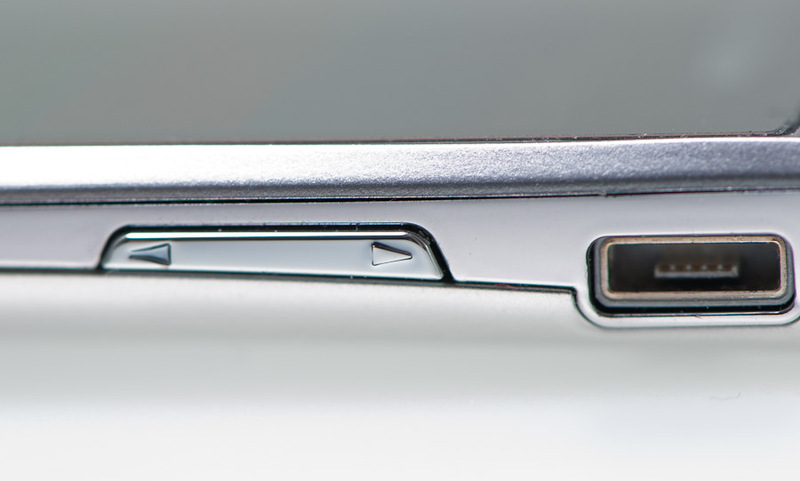 The claimed 8.7 mm thickness is at the center and thinnest part of the phone while the thickest part is approximately 10.5 mm which we would say is average for being a 2011 smartphone. I am capturing close to 15.000 images yearly with a DSLR, so I know what I want, need and must have in a camera. What we have seen so far regarding the camera in mobile phones is an increase in number of megapixels. This is not what I want from my camera. I want instant shutter response, quick autofocus, exact white balance and exposure and a great handling. The Xperia Arc are very good at three of these request. The handling is one the things that should have been better. 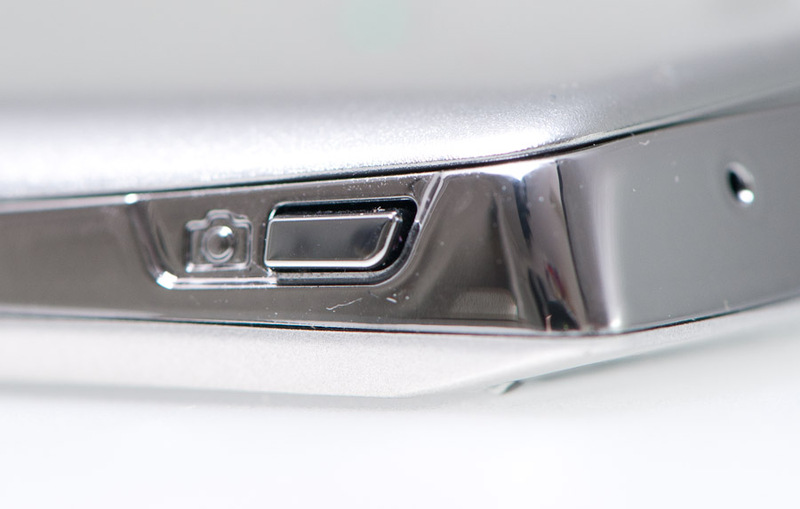 In our opinion, both the camera lens and the shutter key are located too far to the sides of the phone. The tiny shutter key is often hard to press because of its placement. And the camera lens is often covered by one of the fingers on the left hand. Access to the camera settings are done with a swipe on the display. The gallery with previously captured images are seen on a row to the right of the view finder, and these can be dragged entirely out of the way or dragged to cover the entire screen. Same thing about the settings. 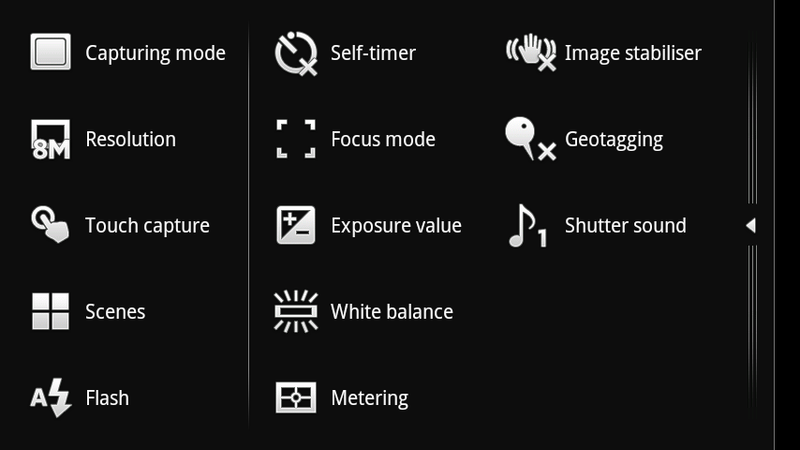 Most used settings are arranged in five icons in a row but by dragging the settings curtain to the right will reveal almost all camera options. 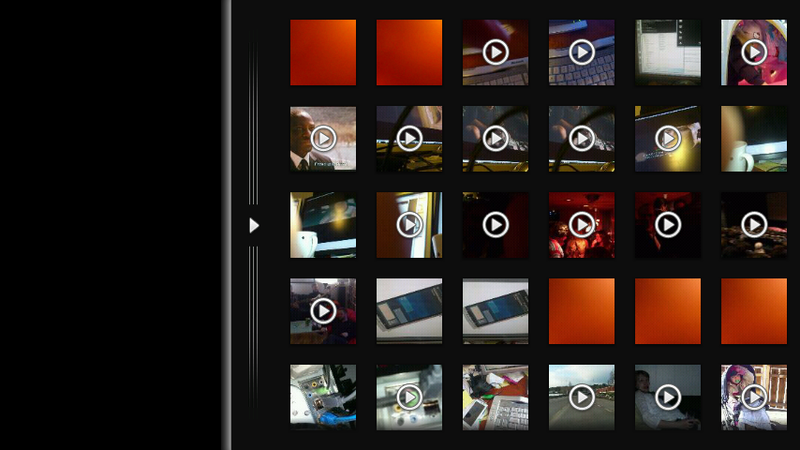 Switching between video and still image recording are easily done by pushing one of the two soft keys at the bottom of the screen. 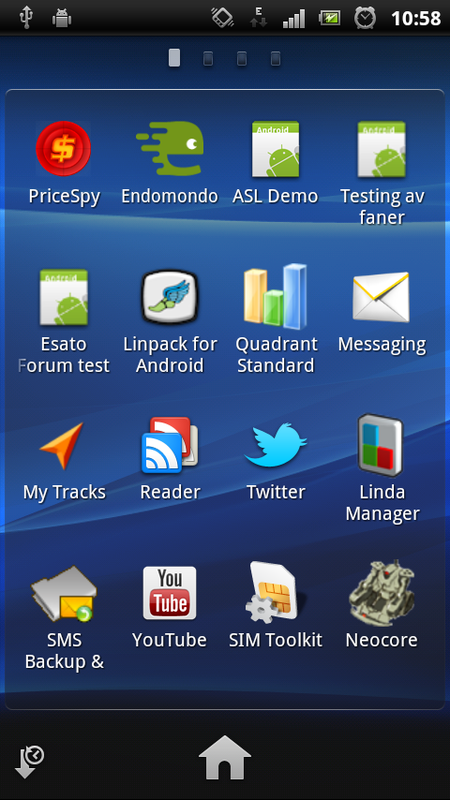 Most applications in Android 2.3 can have landscape, portrait and inverted landscape orientation. 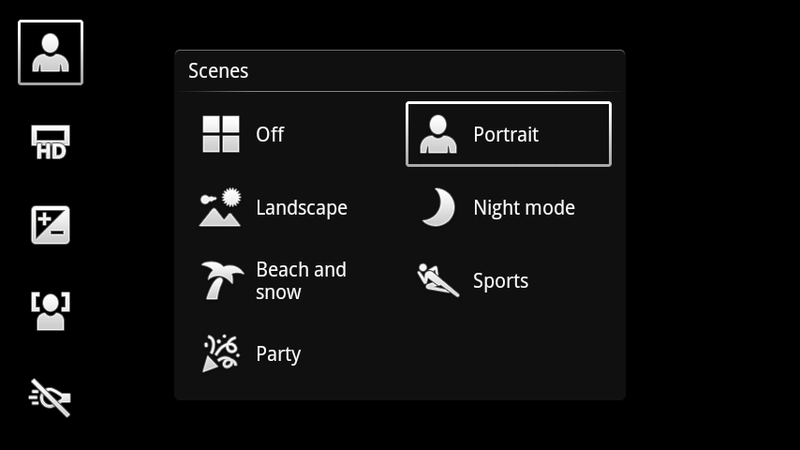 Meaning that if the phone is tilted from normal portrait to the left or right, the orientation of the application will follow. Not so in the camera. 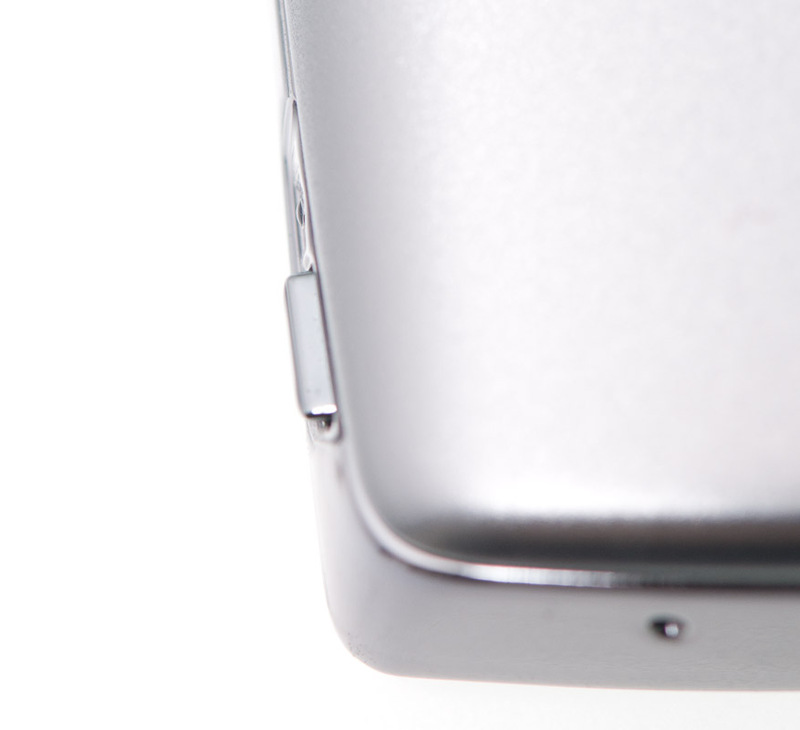 It will always have the landscape orientation so that the shutter key are located on top of the phone. We also consider the camera response time to be a part of what we call camera handling. 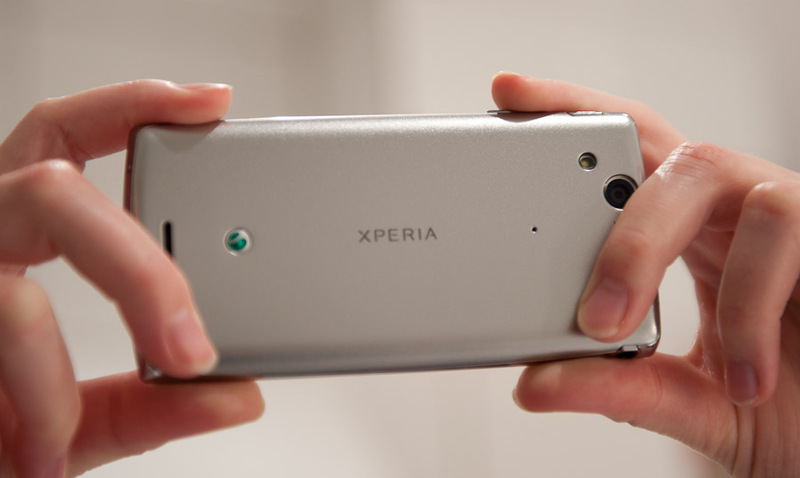 Xperia Arc autofocus time and image capture can be as fast as 1 image per second! Try that with your current mobile phone. Normal daylight photos are of similar quality as a Xperia X10 on Android 2.1. White balance precision by the Xperia Arc is very good. Only a handful of our 500+ the test photos had unacceptable white balance. 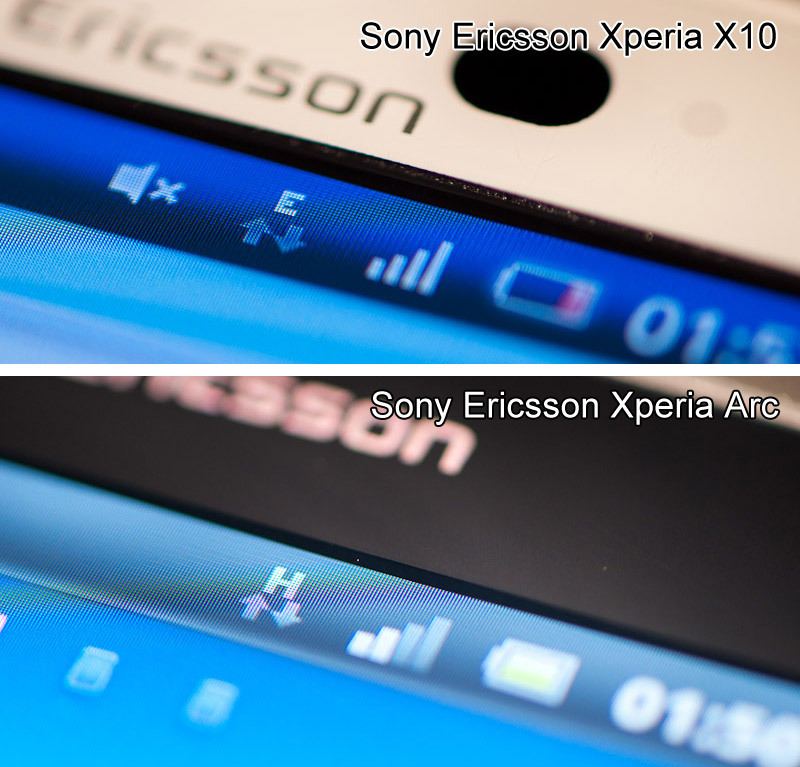 We have shot and compared 50-60 images with the Xperia X10 and the Xperia Arc. Both phones has a 8 megapixel camera, are made by Sony Ericsson and both are running Android. The first thing we noticed was that the X10 file size was much higher than those from the Arc. 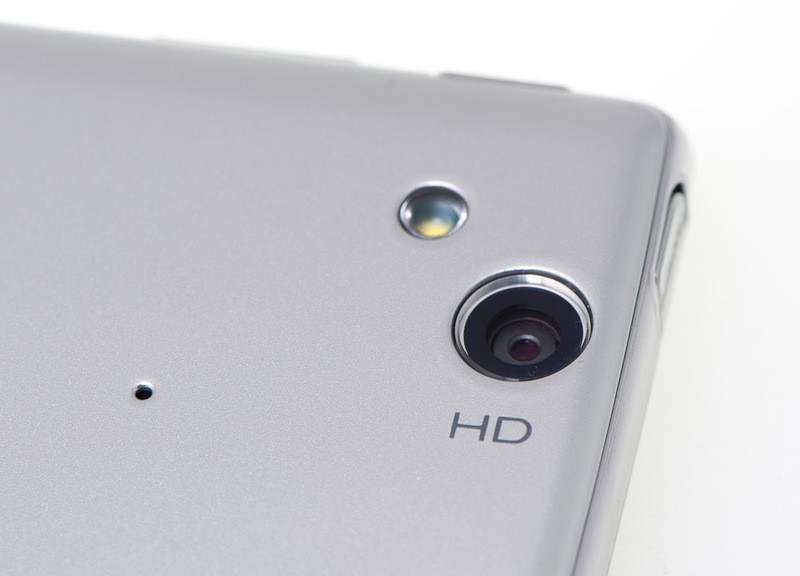 In our test images, the average file size from the Xperia X10 was 2.63 MB. Photos of the same motive, captured with the Xperia Arc resulted in an average of 1.2 MB per file. The mixture of motives had graduated edges such as the sky and snow and others was with sharp contrast such as tree branches and gravel. Xperia Arcs smaller file size does indeed affect image quality. If you are looking at the images at 100% magnification you will see the JPEG artifact caused by too much compression. 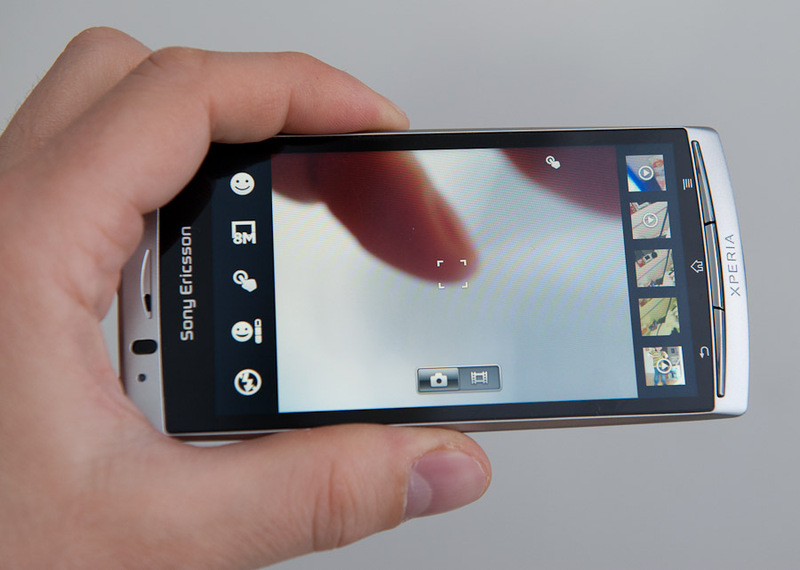 By compressing the files as much as the Xperia Arc does, images will loose details. Hopefully, a future firmware update will let users choose the JPEG compression level to certain extent. For those of you interested in some specifications about the images we have captured we can inform that the maximum ISO settings found is 2500. We have seen images with ISO 4000 on earlier photos, but that was from prototype units. 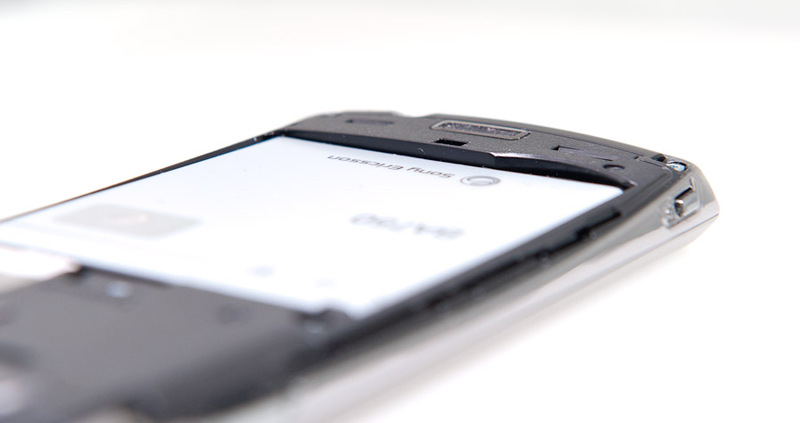 2500 is the largest ISO number we got on our test images during the 500 photos and four weeks we tested the Xperia Arc. 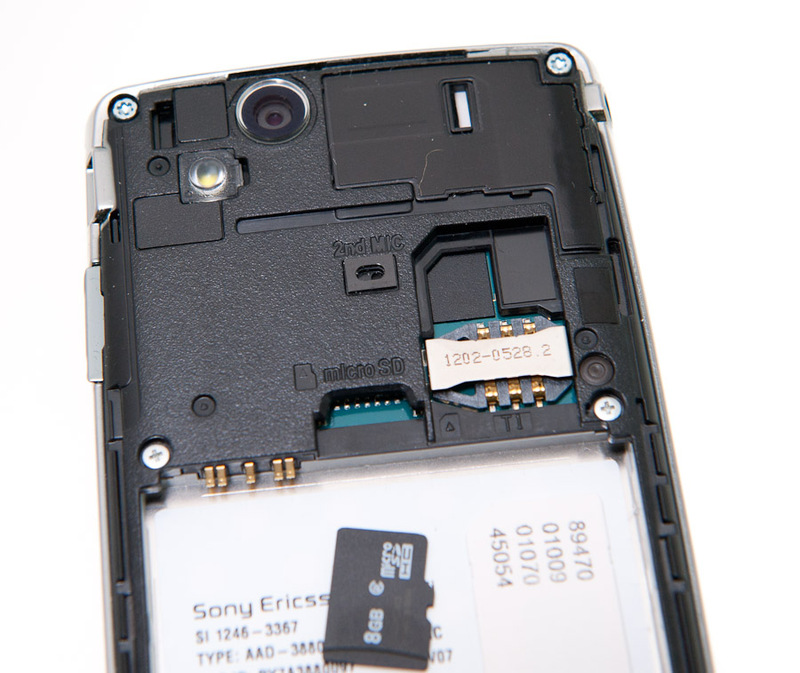 Most new mobile phones has a maximum ISO of 800, so the Xperia Arc numbers are very high for a mobile phone and the relatively small 1/3.2" sensor module. ISO can not be set manually so it is up to the camera and not the user to do this. When the ISO goes up and the shutter speed is constant, less light is needed to capture the same image. The disadvantage of increasing the ISO is that is that images get more colour or luminance noise. Luminance noise is acceptable to a certain extend, but colour or "chroma" noise is something we do not want in our photos. 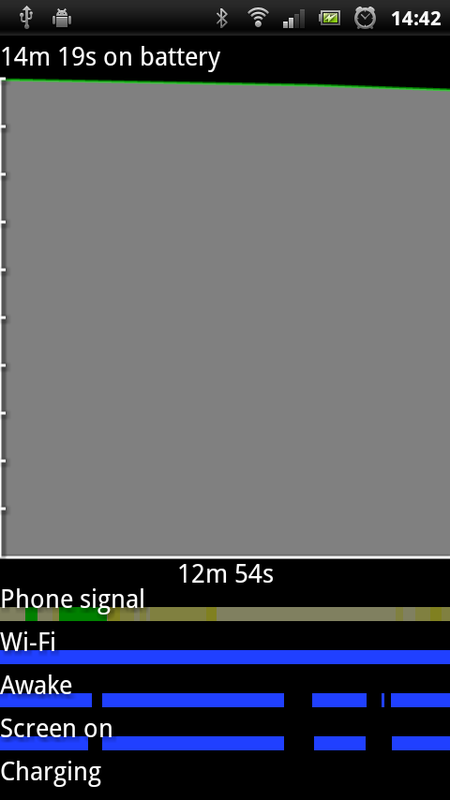 And this is where Xperia Arc fail. The chroma noise is evident even at low ISO. Another drawback is that the chroma noise not is of fine-grained type, but a low frequency making it more visible to the human eye. The low frequency color noise often tend to stick to images even after a dimension reduction. It is preferable to go for the lowest possible ISO when taking photos. Image sensors found in mobile phones are usually optimized for low ISO (varies between ISO 50-100 on mobile phones) because this is the range where the sensor have least amount of image noise. The price for being a good performer at high ISO is being less good at lower ISO. 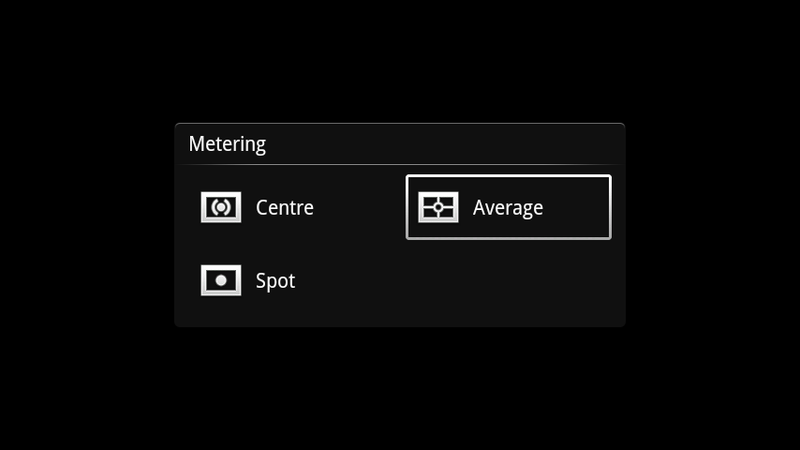 Instead of offering uncalibrated 50 ISO with low image quality, the Xperia Arc start the ISO range on 80. As we said before, higher ISO results in more noise. At the lowest level this does not matter much and the new image sensor used in the Arc might be better on low ISO than its successors. Depending on what you are using your photos for, the noise might not be of importance for you. Images that are reduced in size (dimension) also removes some of the noise at the same time. Noise is the Exmor R drawback. The advantage is the very good white-balance, correct exposure and quick focus. 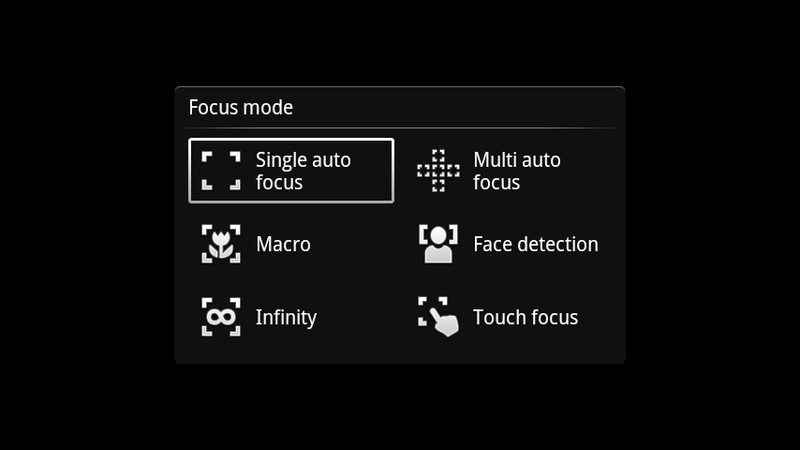 More light in to the sensor makes it easier for the camera to adjust to correct autofocus quickly. For video recording, the good low light performance is of even more importance. Xperia Arc is constantly focusing during video recording, and doing this indoors in low light is no problem because of the Arc's low light capabilities. Remember that a 720p resolution only is 1280 x 720 pixels and only 0.92 megapixel, so the image noise we find in still photos is not as evident in motion pictures due to file compression, reduced resolution and time each frame are shown to the user (30 frames per second). 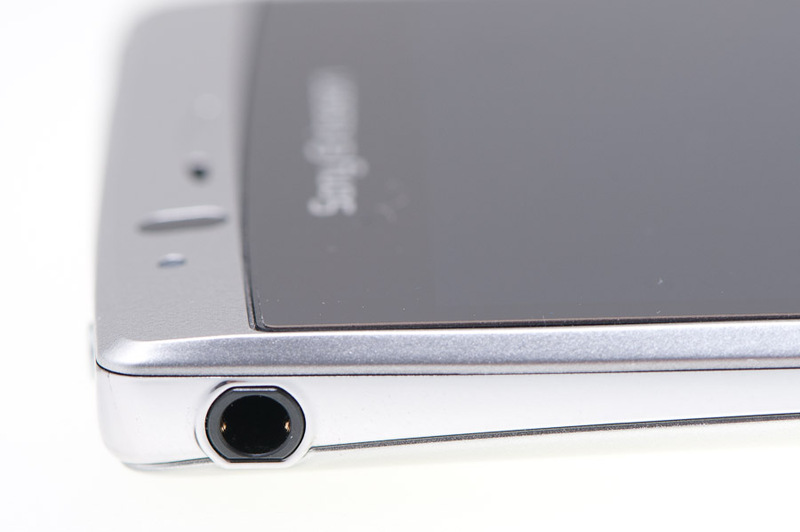 The Xperia Arc microphone is located on the bottom of the device. Speech quality is good but when recording videos, we found that many of our recordings had low sound quality because the right hand was placed directly over the microphone. 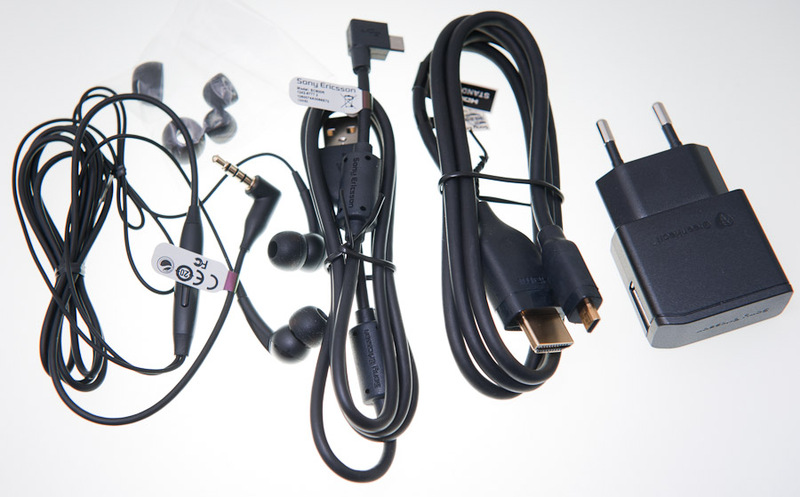 Hopefully, Sony Ericsson will add a directional video microphone towards the recorded objects on their next mobile phones. 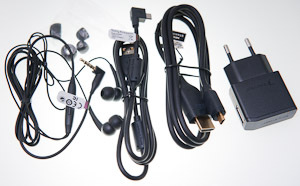 The second microphone on the back which are used for noise cancelling during phone conversation is not used for recording audio during video recording. One annoying thing about the video recorder is that the shutter sound quite often beeps after the recording has started. We haven't manage to find out in which circumstances this happens and it seems random. A check of the first 59 recordings we did, we found that 8 was recording the shutter sound at the start of the recording. 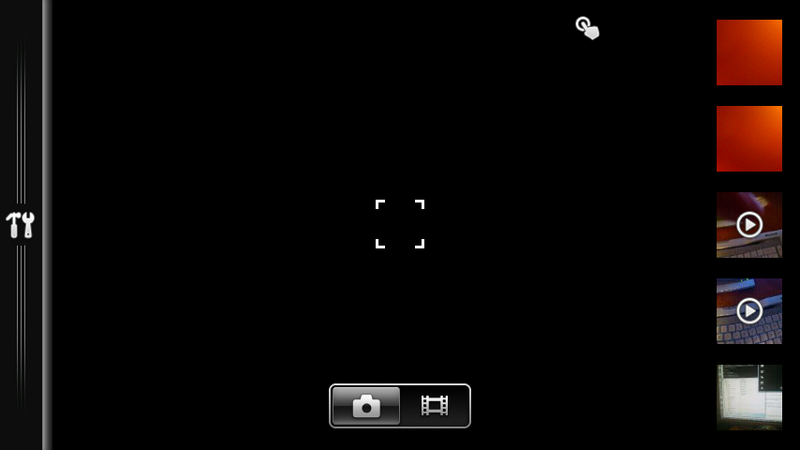 This is obviously a bug in the camera application. 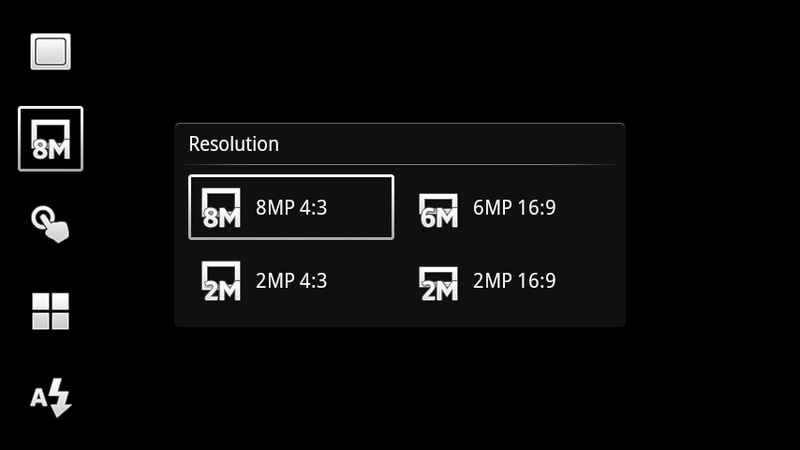 Aspect ration is 4:3 and 16:9 for the full 8 megapixel still photos and video recording, respectively. That's a 1.3 to 1 relationship for 8 megapixel photos and 1.77 for video recordings. 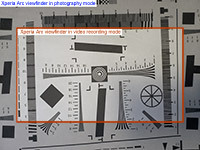 When video recording is active, the viewfinder (screen) is entirely covered by what is being recorded but in still photo mode, black frames are visible on the left and right side of the live view. Whereas the focal length for photos are impressive 28mm (using 35 mm conversion) wide-angle lens, video recording is more narrow and you will not get the entire 28mm still photo focal length into the viewfinder. We have done some measurements and are having a educated guessing that video recordings are done with focal length of 32 mm. Compare the views in the illustration below. 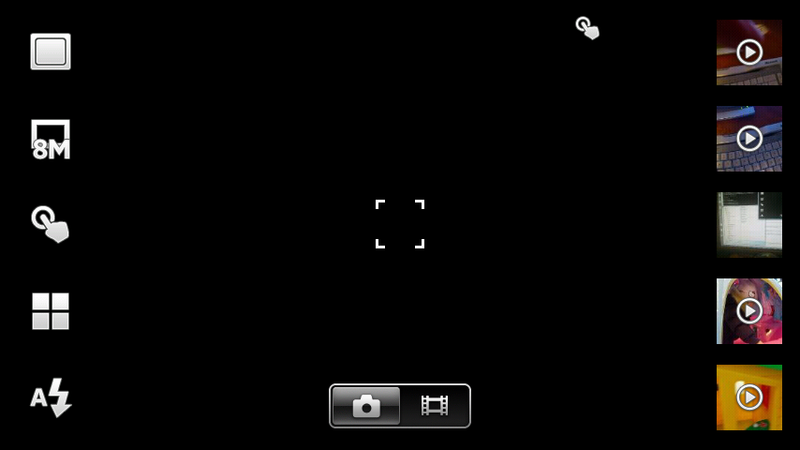 One of the most impressive things about the Xperia Arc camera is the time it takes to start up the camera application and being ready to capture photos. On average, less than 2 seconds is the time used from a push on the camera shutter key until the camera is ready for photo shoots. The Arc is quick in other ways too. We measured how many photos we were able to capture per second, and the high number surprised us. Under optimal conditions where the camera found correct focus very fast, we managed to capture 23 images in 21 seconds. 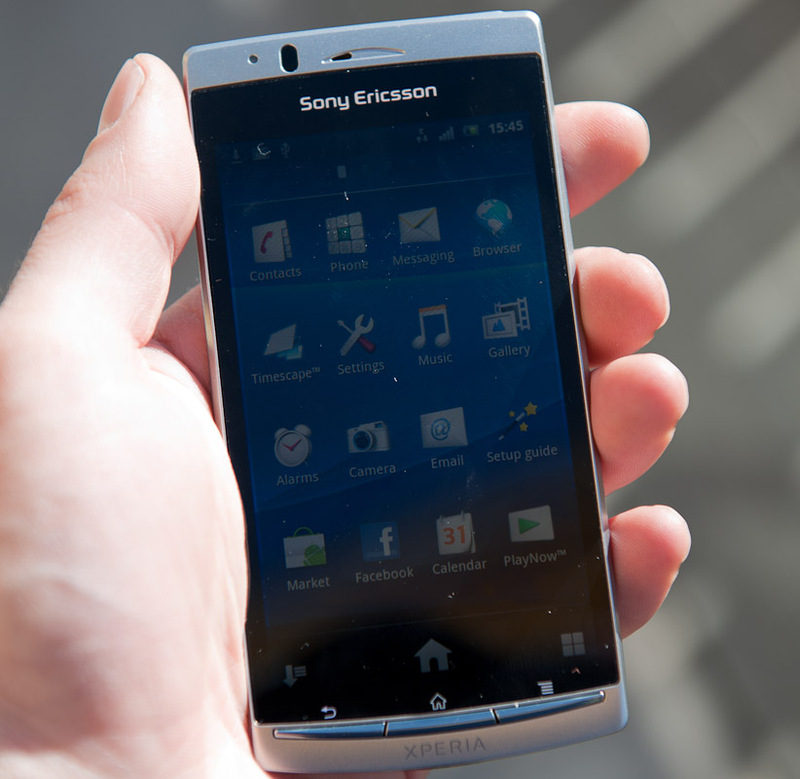 The Xperia Arc is the first mobile phone from Sony Ericsson that are equipped with the Smart Zoom functionality also found in some of the compact cameras from Sony. Unlike digital zoom which capture an image at low resolution and then increases the image size, smart zoom will throw away unused part of the image without enlarging the saved part. 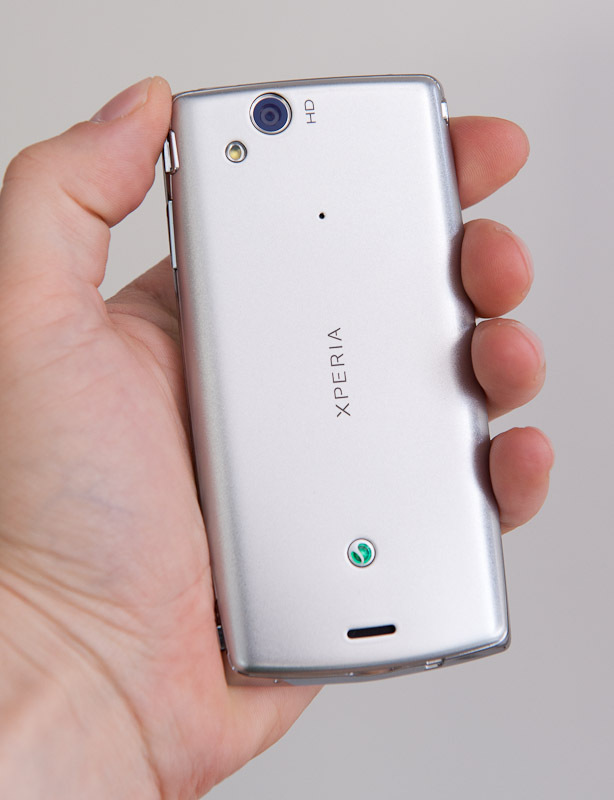 Xperia Arc has four resolution settings: 8 megapixels with 4:3 aspect ratio, 6 megapixel at 16:9 and 2 megapixel with 4:3 or 16:9 aspect ration. Smart Zoom does only work one of the two 2 megapixel resolutions. Timescape and Mediascape as we know it from the first generation of Xperia Android models are gone. 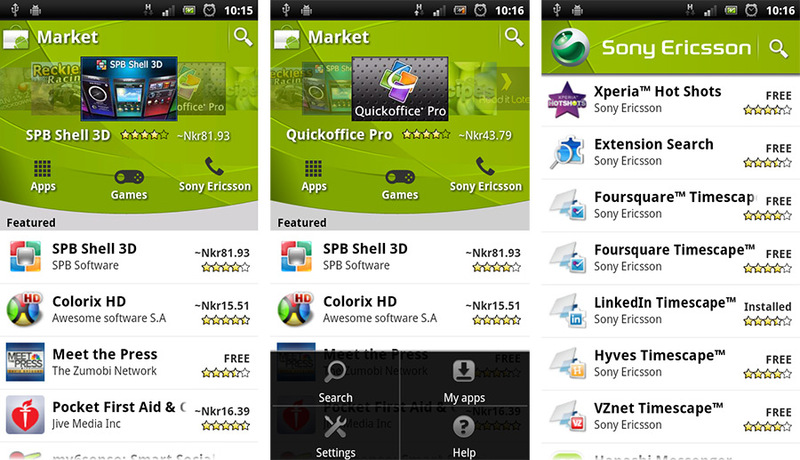 These apps are no longer a part of the modified Android operating system. Instead the Timescape has become a regular widget which the user can customize and place anywhere he pleases. Timescape is an application which connects your contacts with online sources. 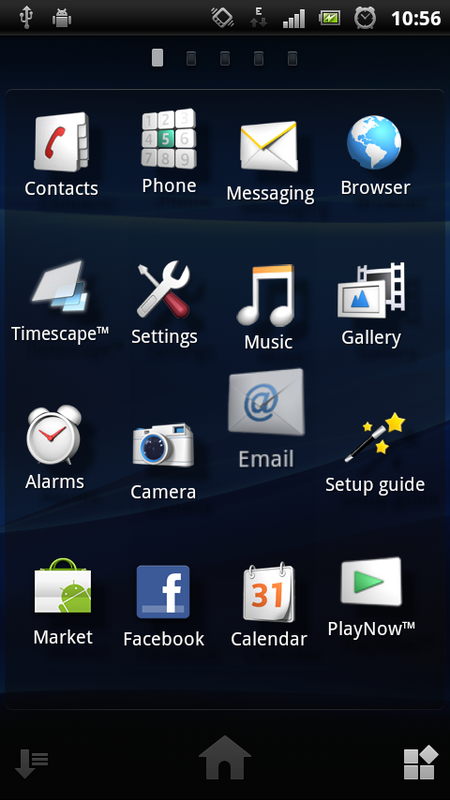 The sources for the Timescape widget can be one or more of Calls, Facebook, Messages and Twitter. 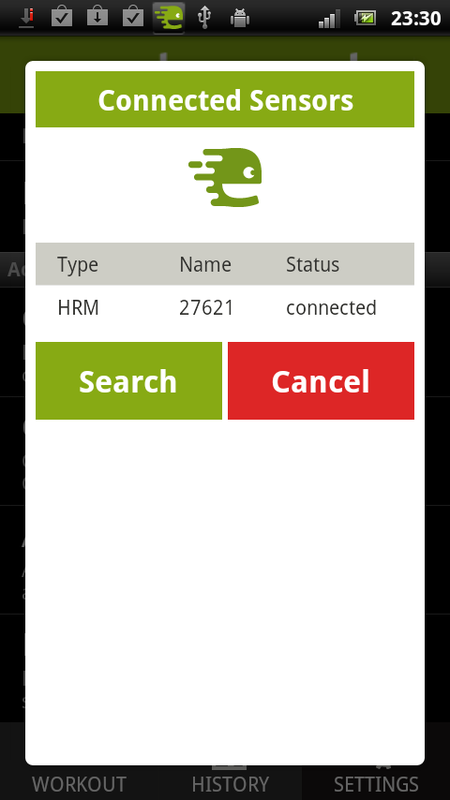 Other Timescape plugins such as LinkedIn, Foursquare and Vznet can be downloaded from the Android Market for free. 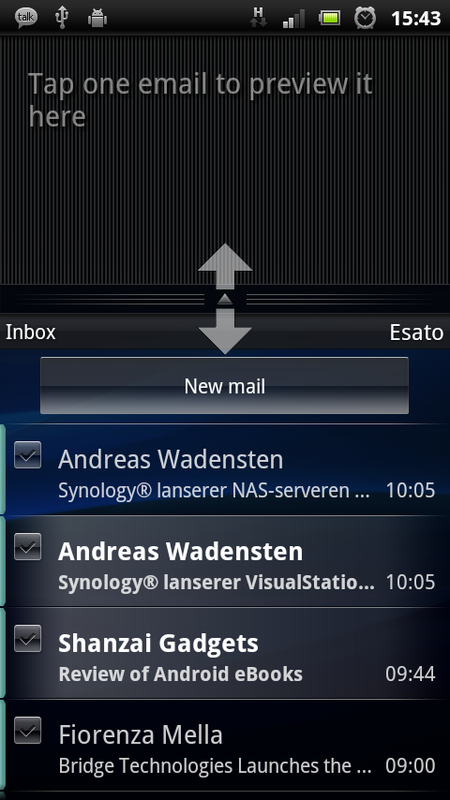 Removing the Sony Ericsson modifications from the Android OS source code and instead offering these as widgets is a tactical move from Sony Ericsson. 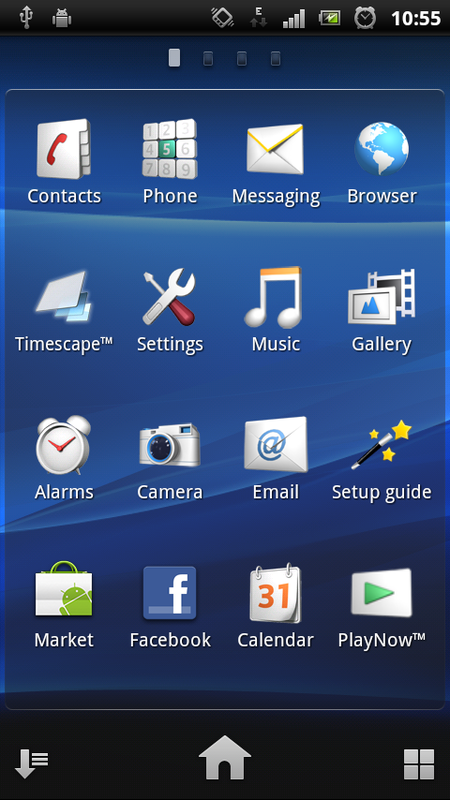 The implementation of Timescape and Mediascape into the Android OS was the main reason why the first generation of Sony Ericsson Android models was very slow in getting new Android updates. Android 2.3 Gingerbread now comes with five home screens. 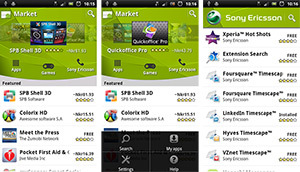 On the Xperia Arc these are customizable in many ways. 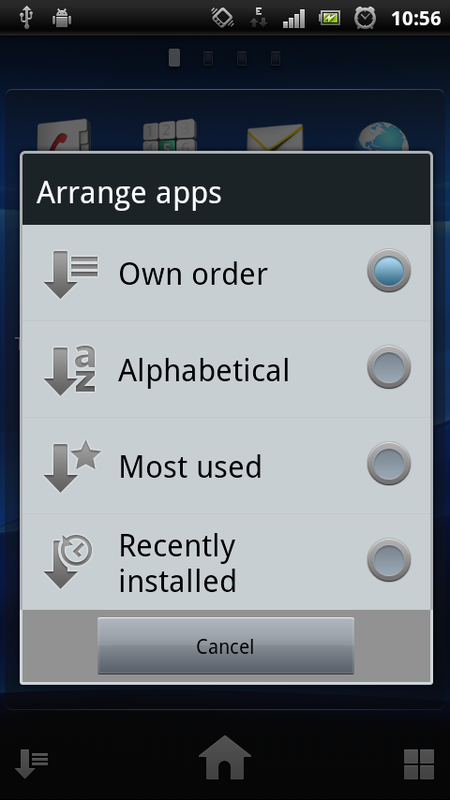 Shortcuts, Widgets and Folders can be added to each of the five screens. 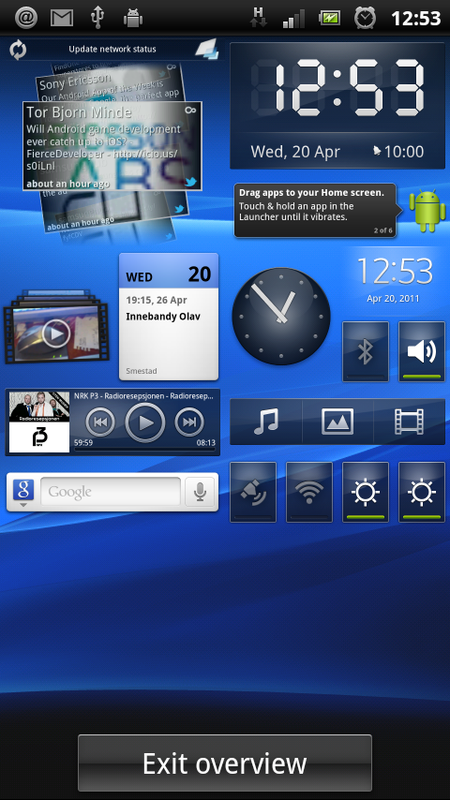 Normal and Live wallpapers are commonly shared by all screens. 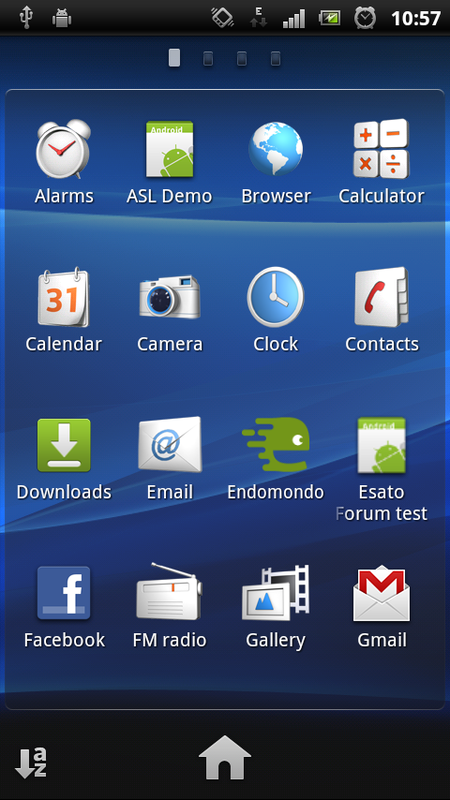 Folder is a special implementation added by Sony Ericsson and it makes it possible to add new folders to one of the five screens or to the screen fixed menu bar. A folder can old up to 16 elements. Any icon located on the screen can be dragged into a folder. Icons from the home screens are moved while icons from the application menus are copied. Remembering which of the five home screens are holding that particular widget or app icon can be difficult if the screens are filled with widgets. 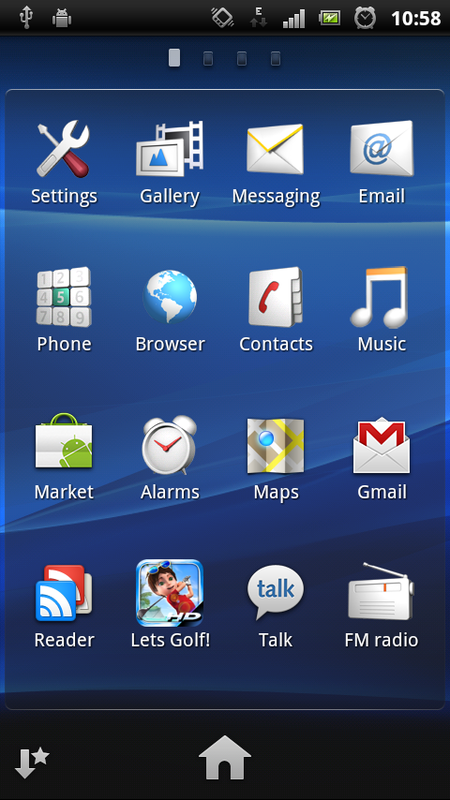 To solve this, Sony Ericsson has made it possible to see all home screen widgets at the same time. Just pinch anywhere on the display to zoom out and see all widgets being reduced and nicely arranged. The email application (not the gmail app) has got a small visual face-lift. It is now possible to have split-screen where email titles are listed to the left or on the top, and the preview pane shows a preview of the email. 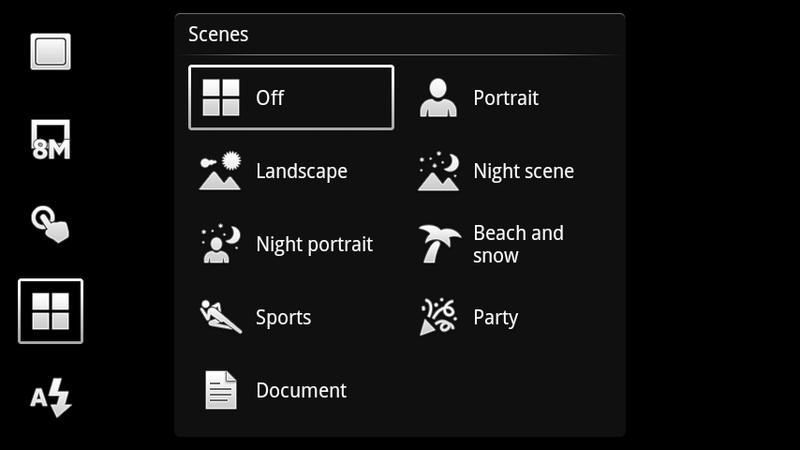 The preview pane functionality can be switch off, set to Landscape or set to Portrait and landscape. We are preferring the Landscape mode, but since it is only room for four titles at once we wish the title font could be smaller. 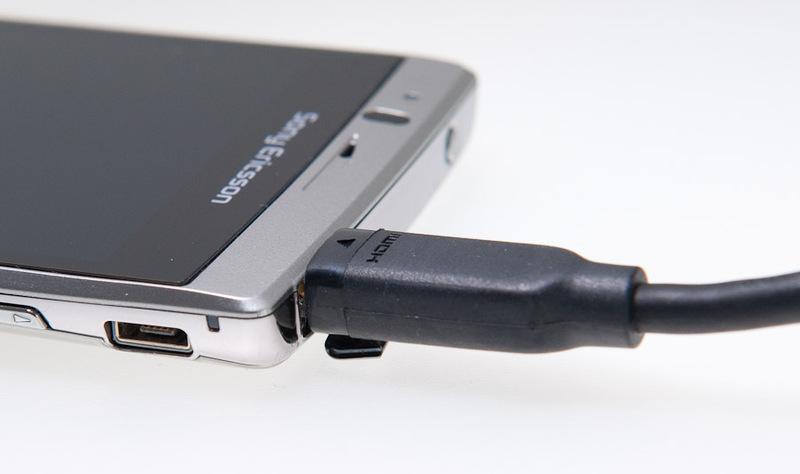 We experienced very low battery performance the first 7-8 charging cycles. 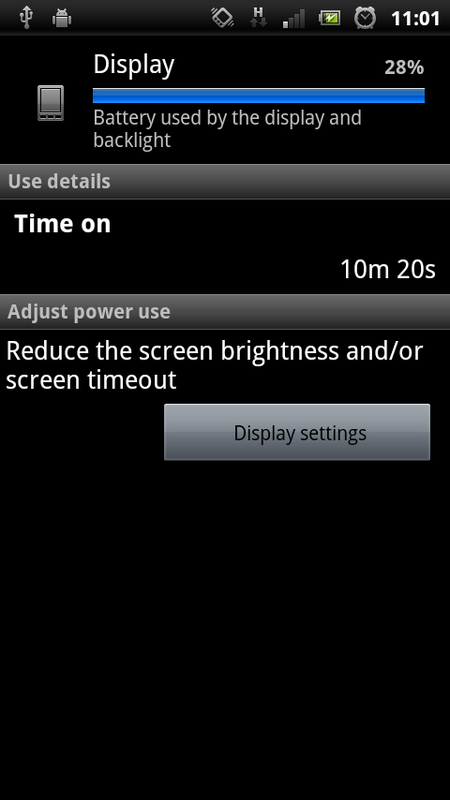 The battery would only last for 4-5 hours before the display went completely black and the phone powered off. We went through full recharging cycles the first 10 times of usage before we finally saw the phone doing its job for 24 hours in a row with "normal" usage. 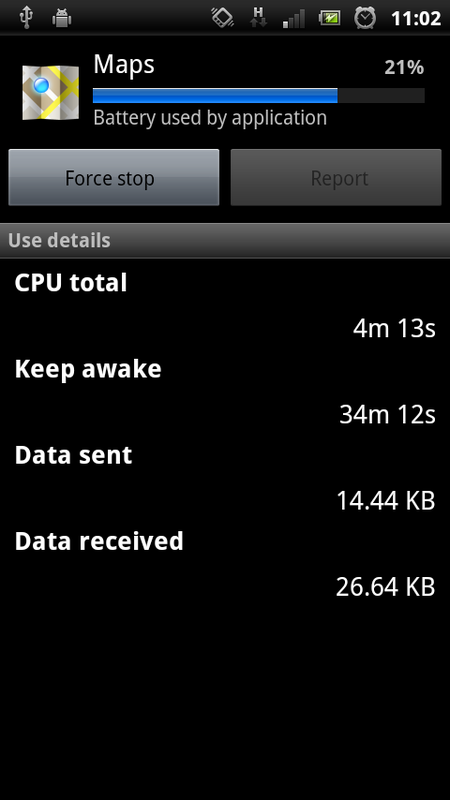 Android 2.3 Gingerbread has a new battery usage page where information about which application and which feature was consuming battery power. 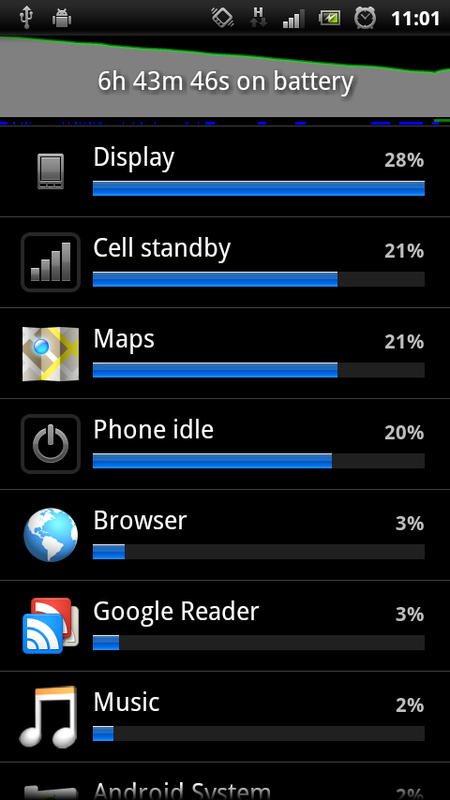 The display is usually using most of the battery. Other things reported by the battery meter are Phone signal, Wi-Fi, Phone Awake, Screen On, Charging in addition to a list of running applications. A timeline will show percentage of power left and which app and feature was active. 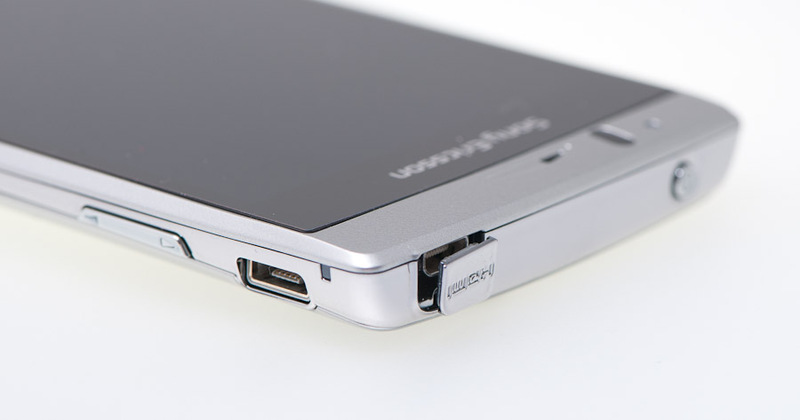 The Xperia arc is currently the only model using the new 1500 mAh BA750 battery. 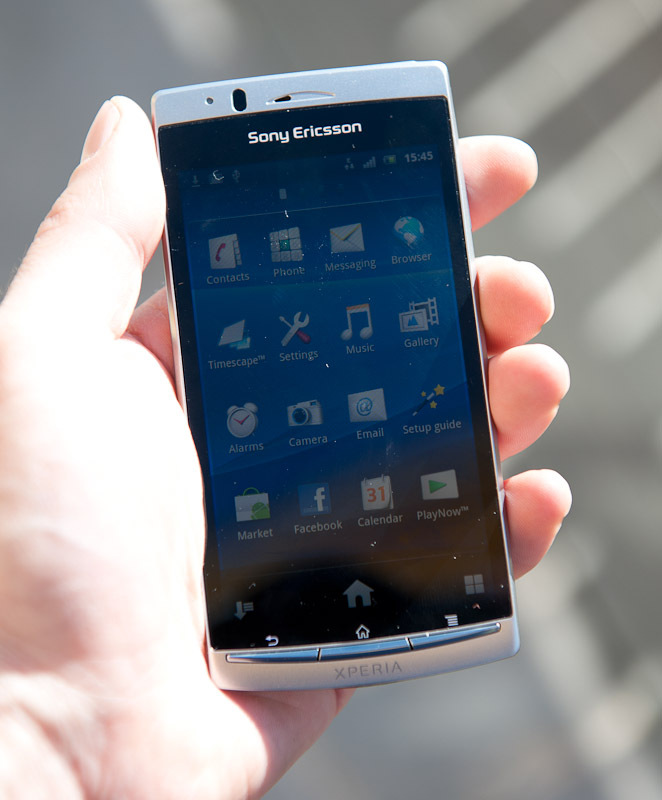 Sony Ericsson Xperia Arc is one of the first phones to support ANT+ where Xperia X8, Xperia X10 Mini and Xperia X10 Mini Pro received a firmware update earlier this year which activated the on-board ANT+ hardware. Support for ANT+ means that the Xperia Arc can be used to communicate with heart rate sensors, bike cadence sensors, blood pressure sensors, temperature sensors and much more. ANT+ is a on-board chip using the same unlicensed 2.4GHz band as Bluetooth and Wi-Fi but with much lower power consumption than these wireless technologies. Typically an ANT+ sensor can run 4 years on a coin cell when sending a message every 2 seconds, 24 hours a day. 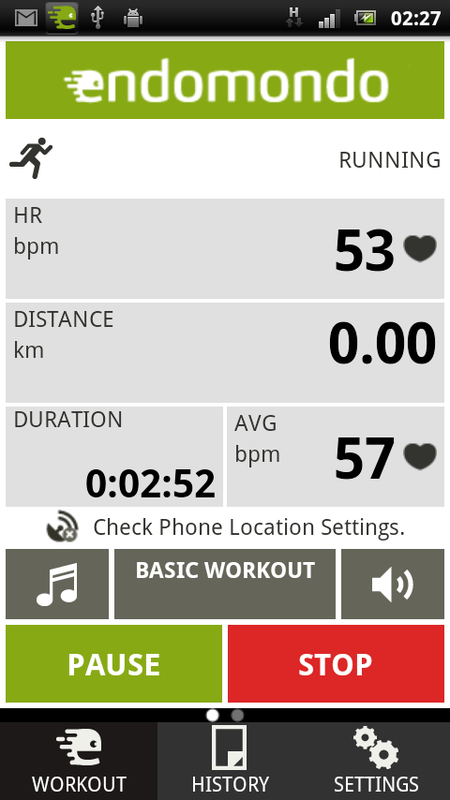 To test the Xperia Arc ANT+ functionality, we downloaded the free version of Endomondo Sports Tracker and used our Garmin heart rate sensor to record our heart beets. It worked like expected. The Endomondo app can for example log your running distance, heart rate, average heart rate, duration, calories and much more. These data can automatically be uploaded to the Endomondo web site where it is possible to view the historical workout data in a nice way. is this better for i fone? i will plan to buy this model,good features but only one main features missing.the front camera. Very nice review, not so long but informational. And nice pictures of the unit as well. Nd whn is Iphone5 getting launch...Can sum1 plz help??? But I have a question, is this phone better that HTC incridible? good review detailing almost everything.what about web browser,internet.pls update the review with internet information. Great review!! !You should definitely do more in depth ones,just like this,with the Arc! Excellent review and excellent phone. I have ordered one on vodafone pay monthly and can't wait to play with it. 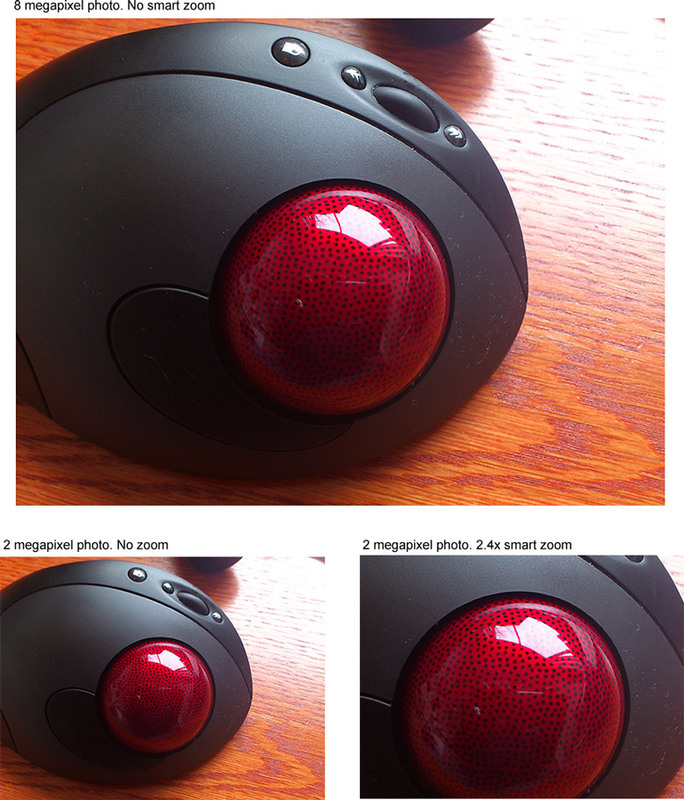 One of the best review on web with lot of new info (lcd, ant+, Bravia Engine function etc.) Great Job! Hope the production version of this phone is much more improved... Also hope they introduce a WALKMAN version soon! good job, very nice detailed review for this great phone! Excellent in depth review & very detailed! !